Barnes & Noble had a rough holiday season: Same-store sales fell compared to a year ago and revenue from sales of the Nook tablet stalled. Despite a heavy investment in the Nook business, Barnes & Noble is expected to have a three-year cumulative loss of more than $700 million, according to Barclays Capital — an indication that the bookstore’s multi-front war with online retailer Amazon.com doesn’t seem to be working. On January 3, Barnes & Noble leadership acknowledged that the firm faces many challenges. The company said its holiday sales for the nine-week period ending December 29 were $1.2 billion, down 10.9% from a year ago. Same-store sales for the period were down 3.1% due to “lower bookstore traffic.” Nook product sales fell 12.6% from a year ago. Barnes & Noble isn’t alone. Many traditional retailers are struggling against online powerhouse Amazon.com. Best Buy has hatched plans to downsize its stores, focus on installation services and match Amazon’s prices. Target, too, has said it will match prices from Amazon and other select online retailers in 2013. Bricks-and-mortar retailers are battling a phenomenon called “the showrooming effect,” the consumer practice of checking out a product in a retail store and then buying it online at a better price. This means that price matching schemes are likely to be futile. “These retailers are competing with a crazy man — [Amazon CEO] Jeff Bezos,” adds Hoch, who notes that Amazon is focused on growing revenue, not necessarily profit margins. Despite the bankruptcy of chief competitor Borders in 2011, Barnes & Noble has struggled to increase sales. It has actively moved to address consumers’ rapid shift from print to digital books and to combat Amazon’s expanding Kindle business. However, Barnes & Noble’s Nook now faces a growing number of competitors in the sector, including Apple’s iPad and iPad Mini and Amazon’s Kindle HD devices, as well as a bevy of tablets based on Google’s Android platform. The challenge for Barnes & Noble is that it lacks a strong digital content ecosystem relative to Amazon, Apple and Google. Both Apple and Amazon, for example, have invested heavily in video content and digital music distribution. Barnes & Noble historically has focused solely on books. The company may not have much choice. According to the Pew Research Center, the number of Americans who read e-books jumped from 16% of those ages 16 and older in 2011 to 23% in 2012. The book reading population for that same age group fell to 75% in late 2012 compared to 78% in 2011. Thirty-three percent of Americans ages 16 and up owned an e-reader or tablet as of late 2012, up from 18% in late 2011. Indeed, to create a book-to-digital bridge with its customers and to drive total sales, Barnes & Noble needs to become more of a destination for consumers, experts at Wharton suggest. Kahn points to Urban Outfitters, J. Crew, Apple and select grocery stores like Whole Foods as examples of chains that provide experiences beyond simply showcasing rows of products. “Merchandising is the most important thing in retailing,” she adds. Another example of a destination retailer is Starbucks, which sells coffee, offers digital content and provides free Internet access. Starbucks’ advantage, however, is that hot coffee is tough to sell online, quips Hoch. But Knowledge@Wharton technology and media editor Kendall Whitehouse notes that Barnes & Noble has launched store-within-a-store concepts, such as its Nook area, children’s section and special promotional areas tied to films like The Hobbit. Yet, while the bookstore chain offers Starbucks coffee, free Wi-Fi and areas for children’s books and toys, the company generally hasn’t translated “hanging out” to increased sales. 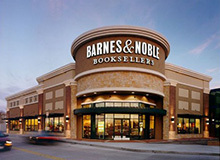 Barnes & Noble has devoted much of its merchandising focus to the Nook. According to its regulatory filings, the chain has more than 1,300 stores and views them as “a major competitive asset…. The company will continue to integrate its traditional retail, trade book and college bookstore businesses with its electronic and Internet offerings, using retail stores in attractive geographic markets to promote and sell digital devices and content. Customers can see, feel and experiment with the Nook in stores,” Barnes & Noble said in the filings. However, it also disclosed in the filing that the company plans to reduce the total number of retail stores it operates. Hoch agrees that Barnes & Noble will have to shrink its store footprint in order to remain competitive. The problem with physical retail chains is that it’s hard to retool store formats quickly, Hoch says, noting that Best Buy faces a similar challenge. Indeed, Barnes & Noble’s biggest asset may be the reality that publishers need shelf space to sell books; without Borders, there are few options. “The American publishing industry would be aghast at losing that shelf space” if Barnes & Noble went out of business, Raff says. As a result, the publishing industry could be more willing to cut deals with Barnes & Noble to offer digital rights bundles with hard-copy books, he adds. For example, Home Depot in recent years has tried to bolster its service by hiring more floor staff as part of the chain’s ongoing battle with fellow home improvement giant Lowe’s. Best Buy, too, has indicated that a key aspect of its survival strategy is to rejuvenate the in-store experience. What is unclear, however, is whether Barnes & Noble leadership sees people as important an asset as rolling out a new version of the Nook. To make that people investment, Barnes & Noble will have to steal a page from its old rival, Borders: Raff notes that the now-defunct bookseller used to give its employees knowledge tests during training to ensure that they had a thorough understanding of store layout and the books available. When Barnes & Noble said on January 3 that sales for the nine-week holiday period would be weaker than expected, the most worrisome detail for analysts was the shortfall in digital sales. Nook device sales fell by an undisclosed amount during the holiday shopping season. According to Barnes & Noble CEO William Lynch, “Nook device sales got off to a good start over the Black Friday period, but then fell short of expectations for the balance of the holiday.” Lynch added that the company is “examining the root cause of the December shortfall in sales” and will adjust. The Nook’s biggest shortcoming, analysts suggest, is that it doesn’t stand out in a crowded tablet market. Barnes & Noble appears to be caught between declining store sales and tough digital competition. “The significance of the deceleration calls into question whether a tipping point in digital is happening,” Stifel Nicolaus analyst David Schick said in a research note. “This has always been a potential concern, but evidence is beginning to mount that the iPad mini likely pressured sales of Nook tablets, and the Kindle Paperwhite was the clear favorite e-ink reader among critics and reviewers this holiday,” beating out the Nook GlowLight and SimpleTouch. Barnes & Noble hasn’t been standing still, however. In 2012, the company forged partnerships with Microsoft, as well as publisher Pearson. On December 28, Barnes & Noble announced that Pearson had invested $89.5 million in the Nook unit, or 5% of the division. Microsoft owns 16.8% of the Nook division due to a $300 million investment in October and Barnes & Noble controls a 78.2% stake.